I was photographing a row of old shophouses when an excited stranger on a motorcycle seek me out. He wanted to inform me of a big event the other side of town. 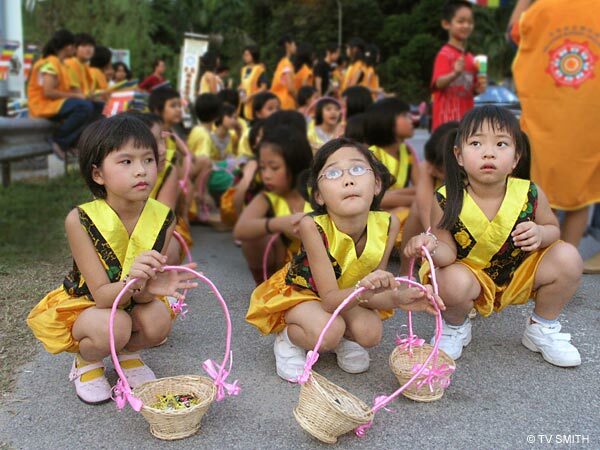 Those nice folks of tiny Kuala Klawang were all dressed up for a glittering Wesak Day procession. Story: Mommy, when's the parade starting? When I arrived at the scene, the little girls were all poised and ready for the camera (left). I happily obliged and waited a bit. Some of the best candids materialised when they got a little tired and distracted.